RT Bus Route 26 provides bus service into the East District of McClellan Park from Watt / I-80 Light Rail Station. Click here for the full route and schedule. McClellan Shuttle (Route 85) has been eliminated. The TMA and the Sacramento Regional Transit are working towards an alternative service that will connect riders from the Roseville road Light Rail Station to all districts of McClellan Park. In the meantime, visit our Uber Program page to sign up for Uber as your last mile connection until the new service begins. The TMA now offers Uber service from your last transit stop to your McClellan Park destination. Click here for more information. 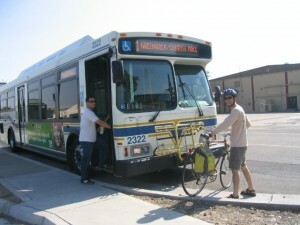 Register with Sac Region 511 at sacregion511.org as a transit rider and use your work zip code as 95652. Log back into Sac Region 511 and download your first-time 75% subsidy coupon. Click here to download the TMA Commuter Benefit Agreement. The TMA will provide you with an RT Connect Card and instructions on how to set up your online account. Every month thereafter you will receive a 50% subsidy. You can do all of this from the convenience of your home or office through your online account.